An ancient watchtower. In 1300 an imposing building with a square plan and a mighty tower was built on this strip of land (570 metres above sea level) close to Arezzo, which marked the boundary between the two Italy, those of the Longobards and Byzantines. The fascinating building of military origin, still visible in the traces of battlements and in a few slit windows, has been carefully restored and transformed into a comfortable holiday villa. Thanks to this radical renovation the villa Torre di Vignale, that rises up majestically amongst thick oak and chestnut woods, has regained the importance and allure that had been eliminated by time. The outdoor area and the panoramic swimming pool. The villa Torre di Vignale is surrounded by a large, panoramic garden full of flowers and equipped with garden furniture, barbecue and wood-burning oven. On one side of the garden, above the villa, there is a beautiful swimming pool (9 x 9 m - depth 1,20 - 2,20 m.). Old-time charm and hospitality. The Villa has been comfortably and rationally furnished, for the most part with antique furniture, adding to the fascination of the house. The owner, Paola, will be happy to prepare meals for guests so that they can sample typical local cuisine. FIRST FLOOR: going up a typical stone staircase you access the sitting-dining room with a large fireplace, large equipped kitchen, two double bedrooms which share a bathroom with shower, bathroom with shower. SECOND FLOOR: three double bedrooms each one with en suite bathroom with shower, bedroom with French bed. THIRD FLOOR: sitting room with fireplace and double sofa bed, bathroom with shower and mezzanine with double bed. A few meters from the house there is a little house with sitting-living room, fireplace, TV and table-football. EQUIPMENT: freezer, dish-washer, washing-machine, oven, iron and ironing board, lemon squeezer, toaster, filter coffee maker, food mixer, moka coffee maker, wood burning oven, table-football, SAT TV, Wi-Fi Internet access. We spent a week at Torre di Vignale and loved it. Everything was as advertised - beautiful garden, imaculate interiors, fully equipped kitchen, outdoor patio with barbeque and of course the gorgeous swimmingpool! The views over the surrounding landscape are fantastic. As most other reviewers has mentioned the drive up to the house may seem intimidating at first try but you get used to it, just dont attempt it with a sports car! The owner and host Paolo is wonderfull, charming and helpfull (although her English skills are close to zero - but that is made up by her great attitude). She even prepared a lovely 4 course dinner for our party of 14 at a very reasonable price. The walk down to the village is about 25min (and 35min back up the hill!) The village has a couple of trattorias/pizzerias, pharmacy, ATM machine and a small allimentari. The drive into Arezzo för shopping takes 20 min (Essalunga supermarket is closest and has a good selection). A day trip to Siena (1 hour) is highly recommended. Also the nearby towns of Citta di Castello and Sansepolcro (about 30 min away) are worth a visit. There are some great wineries to viait in the hills above Arezzo - I can recommend Podere di Pomaio! We enjoyed our 9 days at Torre Di Vignale very much. Everything was as described, or BETTER!!! 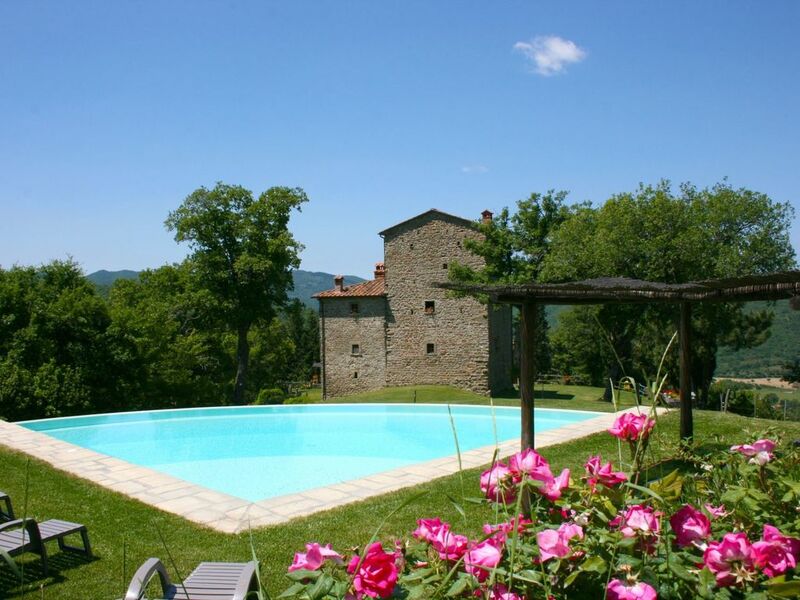 Ideal for large families/friends who want isolation in the Hills -- 15 minutes from Arezzo--provided you are self-sufficient in the sense that you are happy to cater for yourselves. Fantastica casa; amplias habitaciones, una piscina estupenda y una cocina perfecta para cocinar en compania. [English translation courtesy of Easy Reserve] Wonderful house; wide bedrooms, a great pool and a kitchen ideal for cooking all together. We had a lovely time at Torre Di Vignale and were warmly welcomed and supported by the owners. An amazing tower, with beautiful views especially when cooking in the wood oven. Well appointed kitchen and clean bathrooms. Owners were quick to attend to any issue that arose. Great place to base yourself for a relaxing getaway (especially around the incredible pool), but a little far from major attractions if active holidays are more your thing.